If you are a ground meat on the barbeque lover (or BBQ lover in general) like I am, this is a place you simply must not miss. “ČINGAČ”, Bar and Grill is situated in the eastern part of the city, this BBQ restaurant has been here forever, or at least as long as I can remember. From the times of my childhood when I went with my father to bring “goodies” home for a Saturday lunch to this day when I occasionally go there with my friends, Čingač has always been an institution. Famous for its “šiš” (shish kebab), it is conveniently situated next to the bus station, only 20 minutes from the city center (bus line 215). One thing is important to say – you do not go there for the atmosphere or if you are having a romantic anniversary. You go there for the meat and that’s it. The menu is quite standard for this kind of place – kebabs, shish kebabs, skewers, livers, pork chops, veal steaks and sausages with side dishes. It is possible to go astray with fried portions of small fishes (srdelice) but I would not suggest it. That’s not why you are here. Numerous bets were won and lost over how many big ŠIŠ portions one can eat. 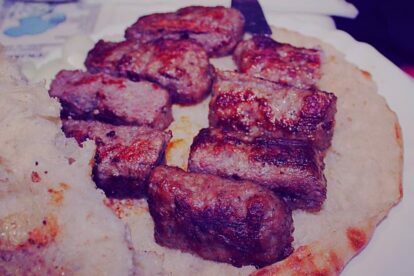 And usually, not even one, because a big portion consist of three bombs of tasty meat on the stick. After you’ve eaten it you are not just fed, you are fed forever :-).